Mount Zion Hospital was established in 1887 by the San Francisco Jewish community as a non-profit hospital to render "medical and surgical aid and service to the needy and distressed sick of the community ... without regard to race or creed." 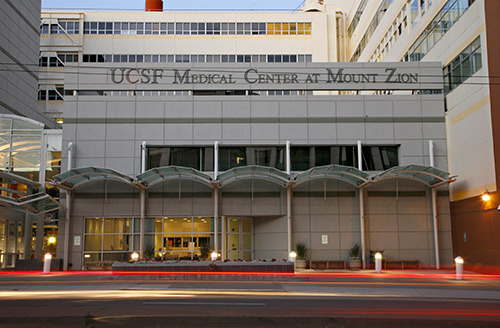 Today, Mount Zion continues its involvement in teaching, research, and patient care as a campus of the UCSF Medical Center. It is a hub for ambulatory care, and home to the Department of General Internal Medicine, the Osher Center for Integrative Medicine, the UCSF Patient Health Library, Women’s Health and more. Get in left lane and exit Octavia Blvd. / Fell St. Turn right on Divisadero St. Turn right on 14th Ave. Turn right on California St.
From left lane, exit Octavia Blvd. / Fell St.
Mount Zion is accessible via the following San Francisco MTA (MUNI) bus routes.